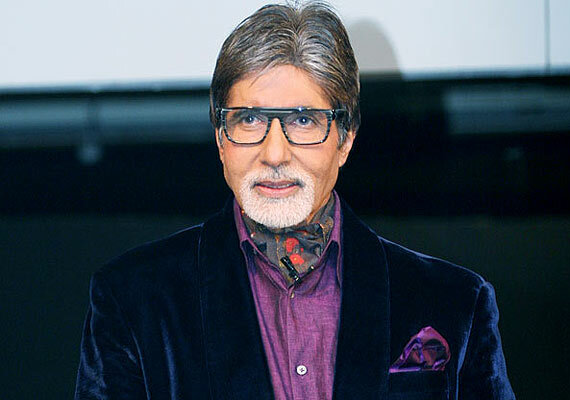 New Delhi [India], Oct 11 : As Bollywood megastar Amitabh Bachchan is celebrating his 74th birthday today, the nation collectively sent him well wishes through the social media. Fans and celebrity alike took to Twitter and other social media platforms to relive the 73-year-old superstar's best moments in the film industry as well as the good things to come following this special day. "Bollywood is famous today because of this two @iamsrk @SrBachchan. #HappyBirthdayAmitabhBachchan," another tweeted with a picture of Bachchan alongside Shah Rukh Khan. Mumbai: As Abhishek Bachchan turned 39 today, father and megastar Amitabh Bachchan recalled the 'joyous' moment when the 'Happy New Year' actor was born. Bachchan, 72, who is a proud father of daughter Shweta and son Abhishek with wife Jaya, wrote on his blog how he celebrated the moment. Kolkata: Megastar Amitabh Bachchan has sung the national anthem, sans any accompanying music, for his forthcoming film 'Shamitabh' and it was shot today at the Jorasanko Thakurbari here, the ancestral home of Rabindranath Tagore, who penned the song. Though the R Balki-directed film is slated to be released on February 6, the decision to include the national anthem in the movie was taken only a couple of days ago. "We went to music director Adesh Srivastava's studio in Mumbai who felt it (the anthem) does not require any music," Bachchan told reporters at the press launch of the film here. New Delhi, Jan 7 : Amitabh Bachchan on Tuesday launched the trailer of the much anticipated movie 'Shamitabh' along with the cast and crew in Mumbai. The film's trailer, which showcases Bachchan in a rugged look with heavy beard and unkempt hairstyle, seems to have increased the curiosity of moviegoers without revealing any inch of the plot. 'Shamitabh' is amalgamation of two letters of Dhanush's name "Sh" which is followed by Amitabh's name and it marks as a debut for Akshara Haasan. Mumbai - Megastar Amitabh Bachchan is planning to start a new campaign for infectious disease caused by the hepatitis B virus (HBV). The 72-year-old actor, who is also a UNICEF Global Ambassador for polio eradication, met doctors recently to strategies the plan. 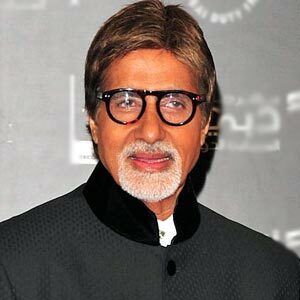 "Wish to start a campaign on awareness of Hepatitis B... Met some committed doctors and shall strategise... Detect and cured asap!," Bachchan posted on Twitter. Apart from his social works, Bachchan is also excited to release the first song of his upcoming release 'Shamitabh' after unveiling the film's first audio poster. 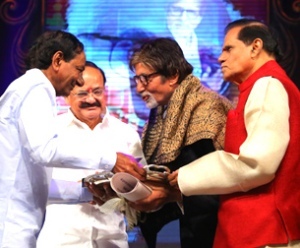 Hyderabad : Bollywood superstar Amitabh Bachchan was today honoured with Akkineni Nageswara Rao (ANR) National Award 2014, instituted by the Akkineni International Foundation. The award was given away in the presence of Telangana Chief Minister K Chandrasekhar Rao and Union Minister M Venkaiah Naidu. Speaking on the occasion, Bachchan said, "It is a privilege to be a part of this industry. It is stalwart like ANR who has given the film industry dignity, respectability and grace." Actor Nagarjuna, son of ANR, said his father had the highest regard for Bachchan's work in the film industry. New Delhi, Dec 26 : Amitabh Bachchan has been conferred with the second Yash Chopra Memorial Award 2014 at an event held in Mumbai recently. Mumbai: Megastar Amitabh Bachchan is excited to visit Kolkata for the second shooting schedule of director Shoojit Sircar's 'next- 'Piku'. The 72-year-old actor started his career as a executive in a company in the city and has shot many films in Kolkata throughout his career. New Delhi, Oct 16 : Amitabh Bachchan recently came out in support for the flood victims of Kashmir and Assam with a charity campaign called "HUM HAIN... Ummeed-e-Kashmir" in New Delhi. The 72-year-old legendary actor appealed to all the citizens of the country to contribute to the cause. Speaking at the event, Bachchan said, "As human beings and as Indians we need to do all that we can help our countrymen in need. The plight of the people of Jammu and Kashmir has always been a matter of concern and the flood s have only made it worse". Mumbai: The Narula brothers, Achin and Sarthak, became the first ever contestants to win the highest prize of Rs 7 crore in reality game show 'Kaun Banega Crorepati', hosted by Bollywood megastar Amitabh Bachchan. The Narula brothers, who hail from Delhi, emerged victorious after answering all the 14 questions correctly with the help of four lifelines. Achin is a marketing manager and Sarthak is a student. Achin has been trying to be a part of the iconic show for the last 10 years but always fell short of being selected for the fastest finger first contest. Surat - Megastar Amitabh Bachchan today returned to host`s chair for the eighth season of popular quiz show `Kaun Banega Crorepati`, which made its season premiere in a grand style in the diamond city of Gujarat for the first time. Bachchan, 71, who is also the brand ambassador of Gujarat tourism, shook a leg on his hit numbers including `Main Hoon Don` and `Party Toh Banti Hai` before taking to the host`s chair. New Delhi, May 23 : Film industry stalwarts Amitabh Bachchan, Rajinikanth and Salman Khan and veteran singer Lata Mangeshkar are in the list of those invited for the swearing-in ceremony of prime minister-designate Narendra Modi, BJP sources said. They are part of a long list of 2,500 guests for the oath-taking ceremony, which will be held in the gravelled forecourt of Rashtrapati Bhavan on May 26. All Lok Sabha and Rajya Sabha MPs will be invited, which alone add up to 777. These MPs have been invited by Rashtrapati Bhavan. However they cannot bring their spouses, according to these sources. New Delhi, Apr 18 : Amitabh Bachchan was spotted celebrating the success of his horror comedy movie, ' Bhoothnath Returns', along with his co-actors Boman Irani, Usha Jadhav and child artist Parth Bhalerao, in Mumbai. Speaking on the movie, the 'Sholay' star said, "It is a quirky movie and a quirky star cast. Such kinds of movies, achieving success is good for the film industry. It leaves an impression on the audience, and makes people think". Boman Irani, who plays a villain in the movie, credited the success of the film to the blend of a social message with comedy. New Delhi, April 9 : "Bhoothnath Returns" will hit the screens in Pakistan Friday, the same day it releases in India. The film's lead actor, megastar Amitabh Bachchan, is glad that the neighbouring nation is warming up to cinema from our country. "I am very happy. We promoted the film in Pakistan through video call, and it is nice to know that they are welcoming our films in their country," Amitabh told IANS here. 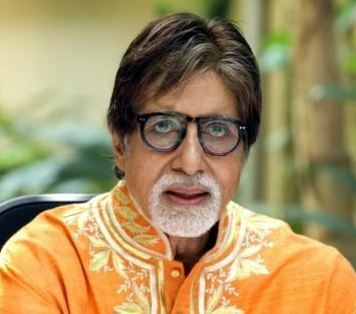 According to a source, Big B has a huge fanbase in Pakistan, and hence the decision to simultaneously release "Bhoothnath Returns" in the two nations. Mumbai, March 25 : Megastar Amitabh Bachchan was conferred India's Global Icon of the Year award at the NRI of the Year awards here. The 71-year-old, who has been ruling the film industry for over four decades now, dedicated the award to the younger generation of actors in the film industry. "I want to thank Times Now (news channel) and ICICI Bank for honouring me with this (NRI) award," Big B told reporters Monday here at the awards red carpet. 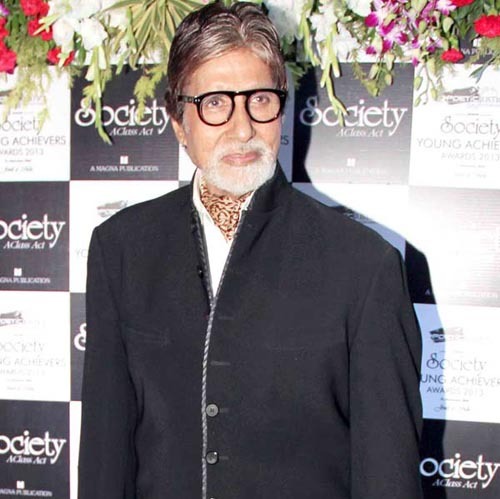 Why did Big B agree to rap for 'Party with Bhoothnath'? Mumbai, March 24 : At 71, Amitabh Bachchan wasn't sure if he would be able to lend his voice to a high voltage rap number. But the fact that special party song "Party With Bhootnath" with popular rapper Yo Yo Honey Singh was "beautifully conceived" drove him to sing for it. 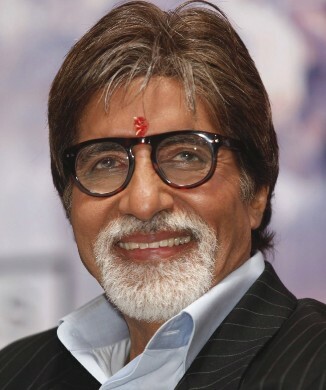 The collaborative song is part of Big B's forthcoming film "Bhootnath Returns". Its video released online last week and it is being loved. Mumbai, Feb 26 - Megastar , who is playing the protagnist in "Bhootnath Returns" says he didn't have the opportunity to share screen space with Ranbir Kapoor, who does a cameo in the film, and hope they can work together some day. "Ranbir has done a cameo but I have not shot with him. He is very popular and I can't compare myself with him. Hope I get to work with him someday," he told reporters during the trailer launch of "Bhootnath Returns". Amitabh says he enjoys working with new generation. Mumbai, Dec 24 : Megastar Amitabh Bachchan says the format of the award function was different earlier as in those days the winners were declared before the event itself. 71-year-old posted on his blog. Mumbai, Dec 19 : Megastar Amitabh Bachchan was honoured with the Star of the Millennium award at the Big Star Entertainment Awards 2013 here. He says he was "embarrassed" when the audience stood for him as he received the award. The 71-year-old received the award for his movie "Satyagraha" at the event held at the Andheri Sports Complex here Wednesday. "The audience stands for me... So embarrassing to be in front of them. I quickly gesticulate to them to be seated... some did, others did not... still embarrassing," Amitabh posted on his blog srbachchan. tumblr. com Wednesday. New Delhi, Dec 14 : With divides like mainstream and parallel cinema, single screens and multiplexes, Indian cinema lives under a divide which is a deterrent to its own good, superstar Shah Rukh Khan said here Saturday, even as Amitabh Bachchan felt the need of the hour is to "blend in" to go global. "Until we don't inculcate a habit of collaborations, we won't be able to inch towards global cinema," Shah Rukh said at the Solutions Summit, a conclave organised by NDTV to celebrate 25 years of its existence.